How It’s New York: Demonstrations going to be held in New York to protest the senseless death of Savita Halappanavar. Such demonstrations are a longstanding tradition in this city, too. Abortion was one of the factors in the presidential election that just took place, and it’s much on the minds of many people. How It’s Irish: The battle between the extreme Catholic hold on law has been going on in Ireland since the state was founded. In this case, there is already a ruling in place mandating that an abortion take place if the life of the mother is at risk, but since no court has legislated for it, hospitals were on their own. And on their own, they have made bad decisions. This one cost a 31-year-old woman her life. A demonstration attended by many was held tonight, Nov. 17, in Dublin. The first will be held at 5PM on Monday, November 19th on Lehman Lawn at Barnard College at 3009 Broadway in Morningside Heights. The second will be held at 6.30PM on Tuesday, November 20th outside the Irish consulate at 345 Park Avenue. Just when you think we’ve heard the worst thing we can hear about Catholic negativity in the civil world in Ireland– we’ve heard about the Industrial schools and the Magdaelne laundries , and while details continue to come out, we’re no longer shocked– comes this story. Right-to-life vs. pro-choice were issues in the presidential campaign, and it was a divisive one for Catholics in America. Would they support Barack Obama, who is pro-choice, or Mitt Romney, who is anti-abortion but then again also dismisses some programs for the poor? But even Romney (if not his running mate Paul Ryan) said he would support abortion when the life of the mother was at risk. Most people would, I think. What happened to Savita Halappanavar was senseless: she lost her life miscarrying a baby– miscarrying, so it had no chance of living anyway. Thanks to author Belinda McKeon for putting these together with Max McGuinness and for alerting us to the rallies taking place here. Belinda writes that they are also going on around the world. We’ll update our facebook page with details as we have them, too. A young woman has died in an Irish hospital because successive Irish governments have failed to legislate for a 20-year-old ruling on abortion in life-threatening circumstances. In the wake of Savita Halappanavar’s tragic and unnecessary death, please join us to express solidarity with the many calls for the Irish government to reform legislation as a matter of urgency. The lives of pregnant women must be protected. The government has stalled shamefully on this issue for far too long. Never again: that is the message being delivered this week by vigils around Ireland and in international cities. month after being denied a termination. miscarriage and died on October 29th. She was 31 years old. in accordance with the Supreme Court’s judgment in the X case. On Sunday 28th October, Savita Halappanavar died in an Irish hospital after being denied a termination which would most likely have saved her life. When she was admitted to hospital on October 21st complaining of severe back pain, she was 17 weeks pregnant. Savita was found to be miscarrying and was assured by doctors that the miscarriage would be over with in a matter of hours. However, her condition did not take its expected course, and Savita was forced to suffer an extremely painful three-day miscarriage, during which her repeated pleas for the foetus to be removed were denied. As long as the foetal heartbeat persisted, she was told, the foetus had to remain in her womb. By way of justification or explanation, the consultant informed Savita that Ireland “is a Catholic country”. Savita, who was Hindu, pointed out that she was neither Irish nor Catholic, to no avail. By the time the foetal heartbeat stopped, she was gravely ill; she had experienced prolonged exposure to infection and had developed septicaemia. Savita died three days later. She was 31 years old. She and her husband had moved to Ireland from India four years previously. Savita’s husband, Praveen, has stated that he and his wife chose Ireland as their home because they had heard it was a good place to start a family. Until this happens, the lives of pregnant women are at risk. 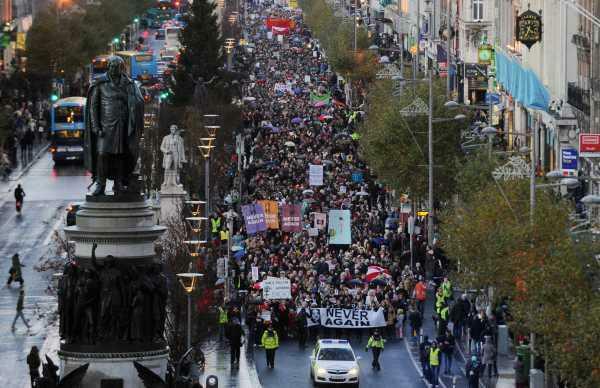 Help us to say to the Irish government: Legislate now. — for they now intend to teach you a lesson you will never ever forget. — then only God save you from Catholic vindictiveness, we in India are too familiar with this during our 400 years of slavery, to white Catholics. Wise men will tell you that people simply do not bring up the country they are in , in a context just like that unless they are being racist. Wisdom dictates — Savita’s tearful termination pleas were taken less seriously because they were perceived as the pleas of an unchurched , uncouth , pagan foreigner who should have some more respect for Irish Catholic beliefs and values. Which Indian doctor will tell a Catholic white woman that you are in HINDU INDIA now? Savita’s doctor knew Savita’s had miscarried and should have aborted her has she requested. She would be alive today if her doctor had performed the abortion. Instead, he stood by, watched her suffer and die. How can a doctor do just stand by has this doctor did. It’s not 1950 it’s 2012 – something should be done before this happens again. The doctor knowing that Savita miscarried should have aborted her regardless of the consequences. Doctor’s save lives not stand by and watch a patient suffer and die needlessly. I’m at a loss to know what to say when Savita’s death could have been avoided. The doctor who made this fatal decision should not be allowed to practice.